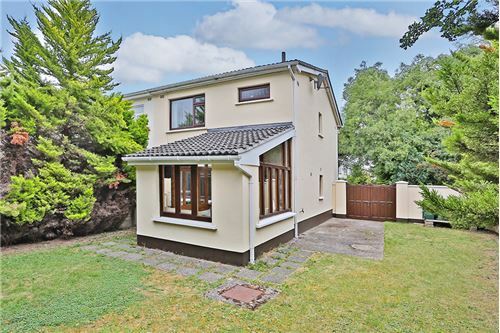 9 THORNHILL HEIGHTS, CELBRIDGE, CO. KILDARE. Selected Top 10 International Selling REMAX Agent for 2017 out of 115,000 agents, Team Lorraine Mulligan of RE/MAX Results welcomes you to this beautifully presented three bed semi-detached property with a large side entrance spanning to nearly 7 metres with a large sunny sun trapped south west facing back garden measuring 25 metres long x 13 metres wide approximately. 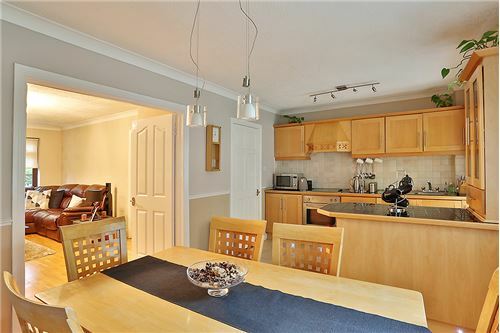 This home is currently owned by a professional couple who keep their home immaculate. 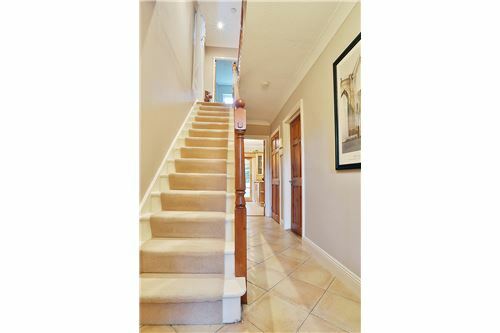 No money needs to be spent on this impressive property and this superb home boasts huge potential. This home enjoys excellent privacy as it is located in a quiet cul de sac with a mature and impressive tree line boundary. 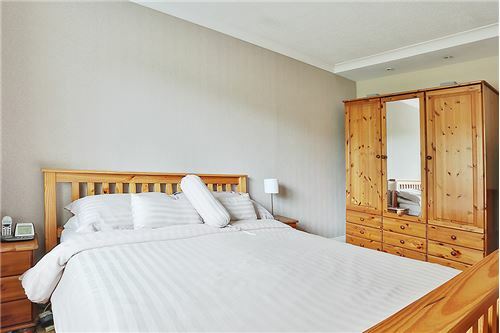 This home is a hidden gem which enjoys idyllic tranquillity. There is plenty off street parking also for safe parking. No. 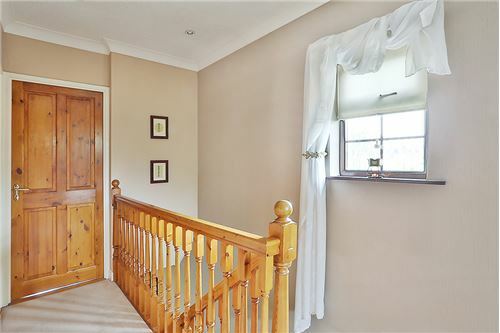 9 also enjoys a large side entrance which would be ideal for an extension subject of course to the relevant planning permission or for the discerning buyer looking for vehicular access down the side of the property. The front and back gardens are wonderfully private and spacious. 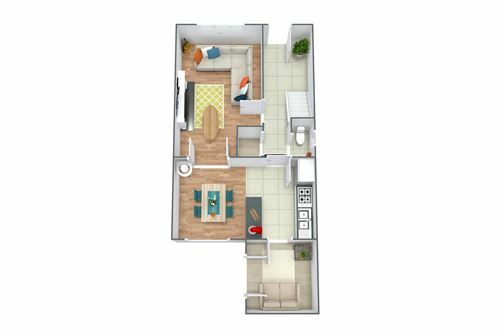 Accommodation briefly consists of a sitting room, kitchen/dining area, sunroom, downstairs guest W.C., hallway, three bedrooms and a family bathroom. 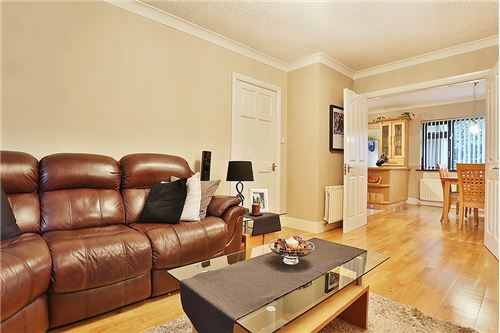 This home boasts the fortunate position to be within a short walk of all local amenities including Scoil Mochua national school, local shops, Aldi, Tesco, Lidl, and with the M4 interchange just a short drive away. The city speed (67X) stops near the entrance to the estate and other Dublin Bus routes are accessed from the Maynooth Road. 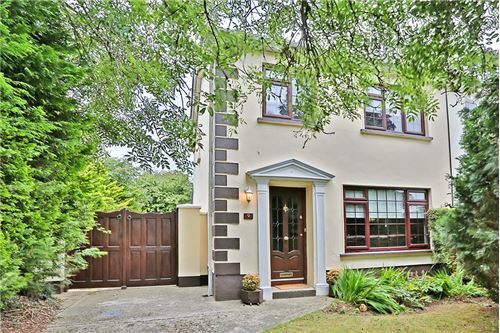 Celbridge is considered to be one of most sought-after locations within the North Kildare market with its historic village, Celbridge Abbey and Castletown House, and is well connected to both public transport and the motorway infrastructure. 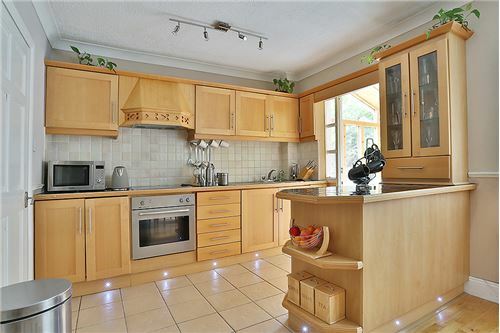 Coving, solid beech shaker style fitted kitchen, tiled splashback area, stainless steel sink, area fully plumbed, integrated oven, ceramic hob, extractor fan, ceramic tiles, engineered oak wooden floor, back door leading to sunroom. W.C., W.H.B., mosaic wall tiles, floor tiles, chrome accessories, curtain. Coving, beech feature fireplace with a brushed stainless steel inset, Dimplex flame effect electric fire and polished granite hearth, blinds, engineered oak floor, t.v. point. 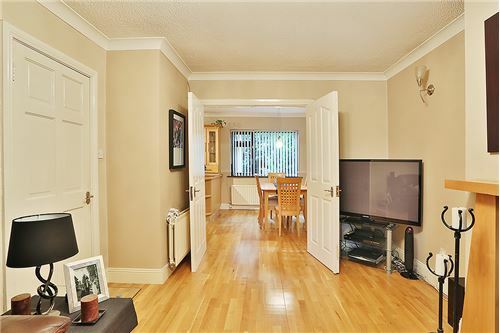 Coving, downstairs storage, tiled floor, carpeted stairs, phone point, alarm key pad. Coving, recessed lights, blind, curtains, engineered oak floor. Coving, recessed lights, blind, curtains, wooden floor. Wall mounted mirror/light fitting, wall tiling, floor tiling, chrome accessories, W.C., W.H.B., “Mira” shower, bath, foldable glass shower screen, brushed steel wall unit. 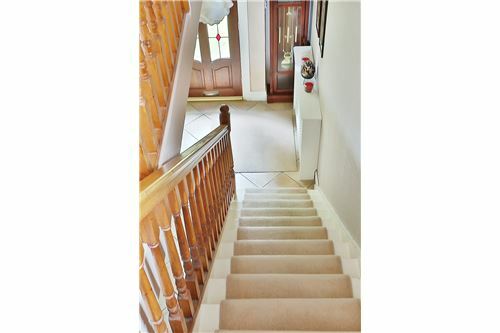 FOR SALE BY PRIVATE TREATY 9 THORNHILL HEIGHTS, CELBRIDGE, CO. KILDARE. Selected Top 10 International Selling REMAX Agent for 2017 out of 115,000 agents, Team Lorraine Mulligan of RE/MAX Results welcomes you to this beautifully presented three bed semi-detached property with a large side entrance spanning to nearly 7 metres with a large sunny sun trapped south west facing back garden measuring 25 metres long x 13 metres wide approximately. 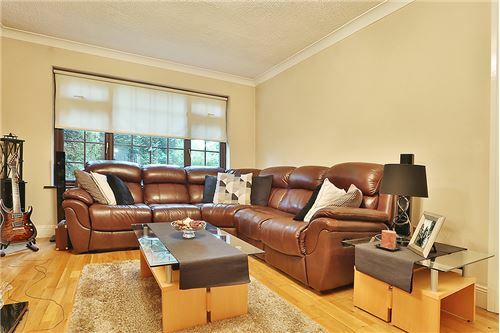 This home is currently owned by a professional couple who keep their home immaculate. 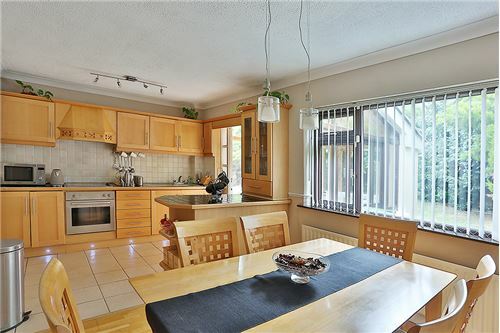 No money needs to be spent on this impressive property and this superb home boasts huge potential. This home enjoys excellent privacy as it is located in a quiet cul de sac with a mature and impressive tree line boundary. 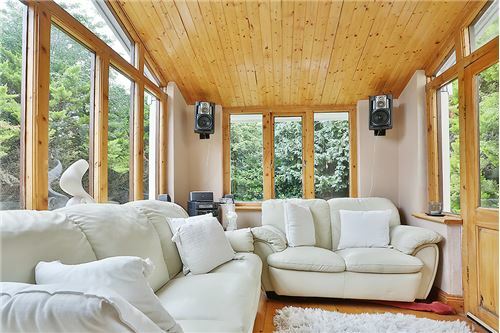 This home is a hidden gem which enjoys idyllic tranquillity. There is plenty off street parking also for safe parking. No. 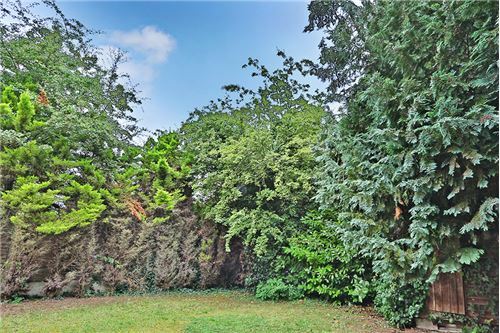 9 also enjoys a large side entrance which would be ideal for an extension subject of course to the relevant planning permission or for the discerning buyer looking for vehicular access down the side of the property. The front and back gardens are wonderfully private and spacious. 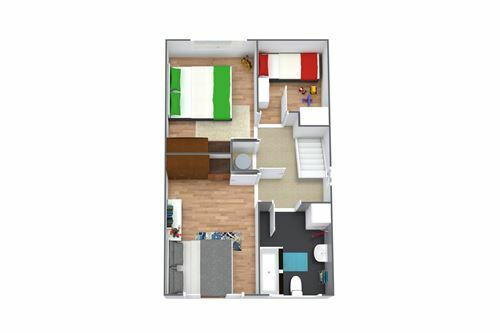 Accommodation briefly consists of a sitting room, kitchen/dining area, sunroom, downstairs guest W.C., hallway, three bedrooms and a family bathroom. 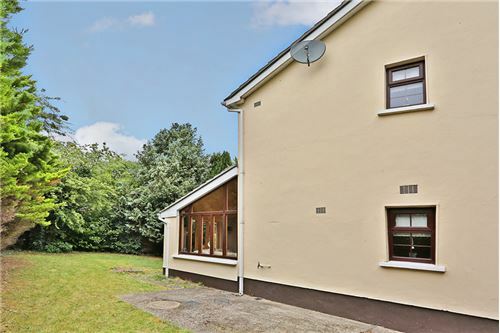 This home boasts the fortunate position to be within a short walk of all local amenities including Scoil Mochua national school, local shops, Aldi, Tesco, Lidl, and with the M4 interchange just a short drive away. The city speed (67X) stops near the entrance to the estate and other Dublin Bus routes are accessed from the Maynooth Road. 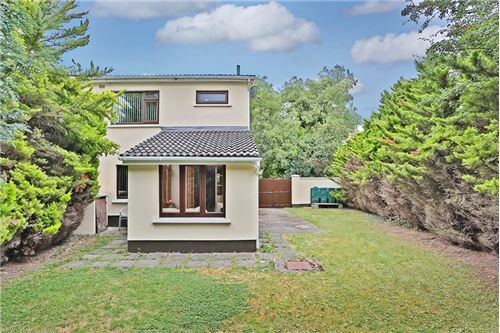 Celbridge is considered to be one of most sought-after locations within the North Kildare market with its historic village, Celbridge Abbey and Castletown House, and is well connected to both public transport and the motorway infrastructure. 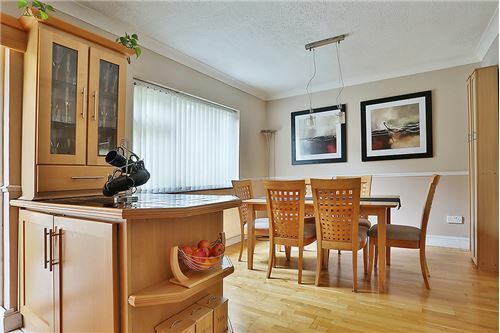 ACCOMMODATION KITCHEN/DINING AREA: 5.26m x 3m Coving, solid beech shaker style fitted kitchen, tiled splashback area, stainless steel sink, area fully plumbed, integrated oven, ceramic hob, extractor fan, ceramic tiles, engineered oak wooden floor, back door leading to sunroom. 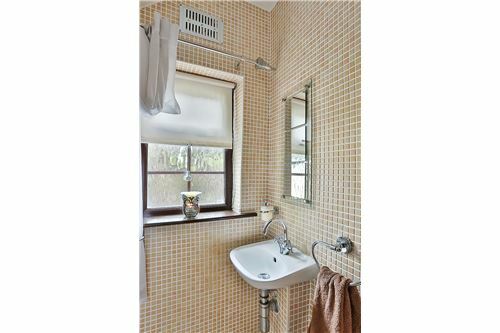 GUEST WC: W.C., W.H.B., mosaic wall tiles, floor tiles, chrome accessories, curtain. 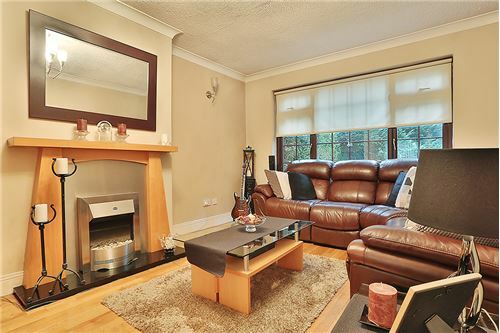 SITTING ROOM: 5.34m x 3.34m Coving, beech feature fireplace with a brushed stainless steel inset, Dimplex flame effect electric fire and polished granite hearth, blinds, engineered oak floor, t.v. point. 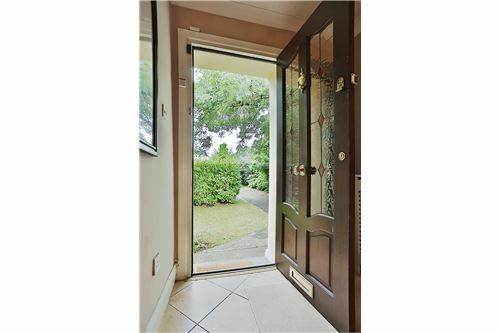 SUNROOM: 2.97m x 2.46m Wooden floor, French doors leading to the garden area, HALL WAY: 5.12m x 1.77m Coving, downstairs storage, tiled floor, carpeted stairs, phone point, alarm key pad. 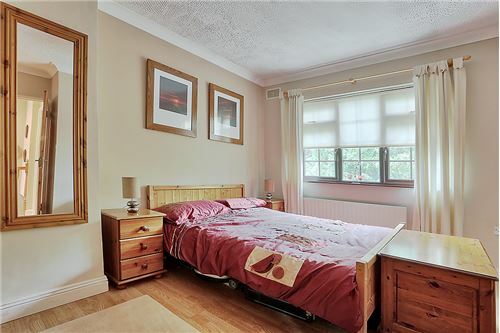 LANDING: Coving, recessed lights, hot press with immersion, carpet, attic access BEDROOM 1: 4.10m x 3.35m Coving, recessed lights, blind, curtains, engineered oak floor. 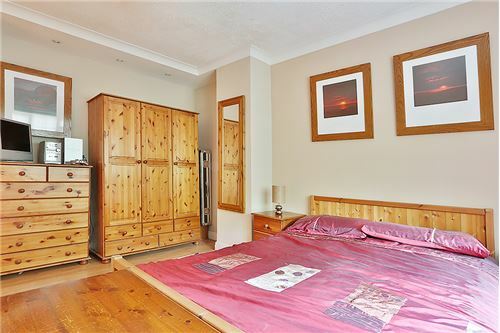 BEDROOM 2: 4.07m x 2.83m Coving, recessed lights, blind, curtains, wooden floor. 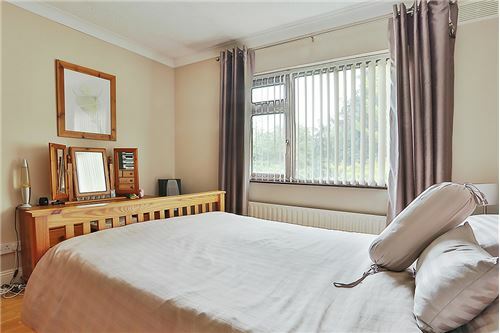 BEDROOM 3: 2.35m x 2.34m Blind, carpet, curtain. 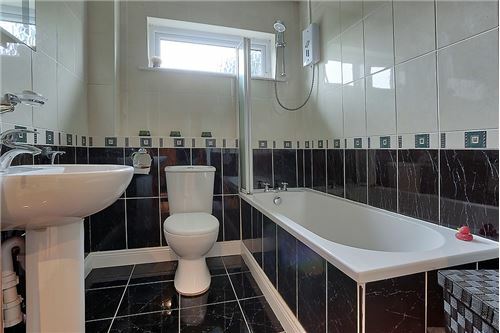 BATHROOM: 2.35m x 1.84m Wall mounted mirror/light fitting, wall tiling, floor tiling, chrome accessories, W.C., W.H.B., “Mira” shower, bath, foldable glass shower screen, brushed steel wall unit. FEATURES INTERNAL: • All curtains & carpets included in the sale • All blinds included in sale • Property fully alarmed (home owner monitored) FEATURES EXTERNAL: • PVC wood effect argon filled double glazed windows • PVC facia & soffit • Outside light • Outside tap • Landscaped mature gardens • Teak vehicular accessible side gates • Property located in a quiet cul de sac • Property not overlooked SQUARE FOOTAGE: C. 95sqm/ C.1,022sqft HOW OLD IS THE PROPERTY: 36 years old BACK GARDEN ORIENTATION: South west facing BER RATING: E1 BER NUMBER: 111303731 SERVICES: Mains water, mains sewerage. HEATING SYSTEM: Oil fired central heating.